Police are still searching for a male suspect who robbed the St. Paris Sunoco station (pictured). ST. PARIS – The St. Paris Police Department is looking for a male suspect who wielded a stun gun while robbing a local gas station Friday evening. According to information released over the weekend, at 8 p.m. Friday, a masked male wearing a black long-sleeved shirt and black pants with a black bandana around his face came into the Sunoco gas station, 355 W. Main St., wielded a handheld stun gun and ordered a store clerk to open the case register. The suspect then took an undisclosed amount of money. The male suspect was believed to be between 5 feet 10 inches and 6 feet 1 inch tall. St. Paris police, along with the Champaign County Sheriff’s Office, searched the area with a K-9 who able to pick up a scent of the suspect before losing it. St. Paris Police Sgt. James Wilkson said Monday that no arrests had been made and the incident remained under investigation. Anyone with information regarding Friday’s incident is urged to contact the St. Paris Police Department at 937-663-4468. 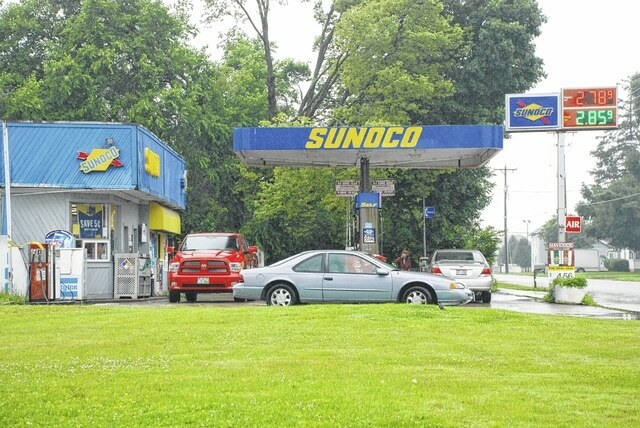 Friday’s incident marked the second time this year the Sunoco gas station has been the victim of a crime. St. Paris police previously reported that on April 26, the front door of the gas station was pried open allowing for a suspect to gain entry once the glass was broken. An ATM was removed from the gas station through the front door. The incident occurred while the gas station was closed. Wilkson said Monday that three men were indicted in Mercer County who are believed to be connected with the April 26 break-in and other crimes from around the state. According to the Mercer County Clerk of Courts website, Danny L. Longstreath, Kenneth M. Longstreath, and John W. Coile Jr., were indicted in Mercer County in May for felony breaking and entering and theft charges. The website also notes the three men were indicted again this month for at least 20 counts each. Information on the alleged conduct that led to the indictments was not available at the time of print. All three men were listed in custody in Mercer County Monday according to the Mercer County Sheriff’s Office website.